This is a walk with an initial climb of a craggy path followed by an ancient undulating GR10 track to the Col de Llagoste at 255m. 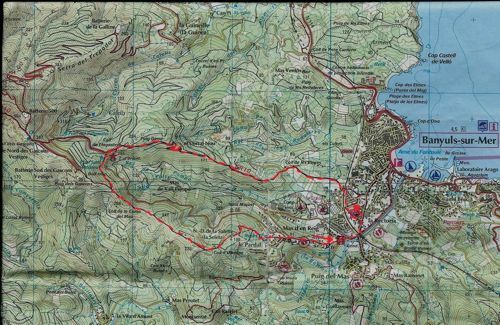 It then adopts an easy gentle drop down to the prominently positioned Chapelle de Salette at 189m before dropping further to Mas d’en Reig (with or without a trip & dégustation in the subterranean caves or hanging gardens of La Serre) and a steep return to Banyuls. Even in January, we witnessed gatekeeper butterflies, raven, gold finches, a flock of chaffinches and a black bumblebees. 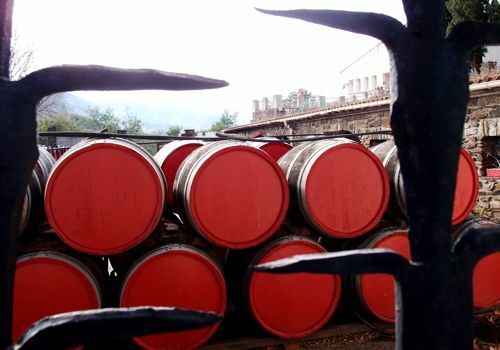 ♣ Head for Banyuls-sur-Mer, (why not try the 1 euro bus? ), turn right at the roundabout on the sea front along the Avenue du Géneral de Gaulle to the monumental 18th railway bridge that crosses the river Baillaury. ♣ Park the car immediately down river to the bridge and opposite on the north side of the avenue du Géneral de Gaulle is a small side road, Avenue du Puig del Mas, joining at a T junction. Take this road, then first left into Rue Charles de Foucault, where adjacent to the town cemetery of family mausoleums abutting the edge of the road is the ancient beautiful Chapelle de la Rectorie. ♣ This area is residential Banyuls. Cross Rue Jules Ferry into Rue des Angles and keeping parallel to the railway line on the left and then, where the road twines to the right becoming Rue du 14 Juillet, take a sharp left through a road / flood tunnel under the railway. This emerges the other side and immediately a yellow sign indicates a sharp right turn up the GR10; easily missed! The network of Grand Randonnée footpaths are an extraordinary feat of ancient European man whose determination before the advent of motor cars relied upon 2 feet to reach destinations and many of them apparently cross several countries. The GR10 follows the frontier between France and Spain along 866km from Banyuls-sur-Mer to Hendaye on the Atlantic coast. This moderately steep climb up a very rugged track, marked by white and red flashes, is the first 3km and should not be attempted in high heels! 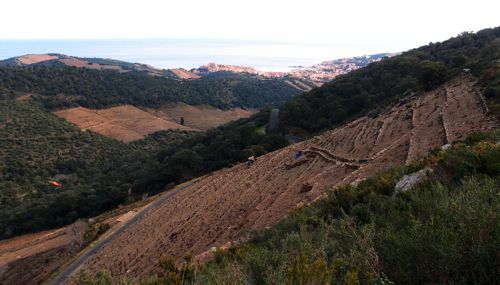 ♣ After 100m, the severe steepness and sharp schistous ruggedness levels out to become a more sympathetic terrain that gently rises between scattered housing and vineyards, crosses a minor road already offering fine views both back over the sea resort and out to Cap Béar with its Sémaphore and Phare. ♣ The path, now quite generous in width and easy underfoot, steadily climbs and winds through cork oak woods and then for a short distance, passes through rustic compounds on both sides of the road and seems to house a menagerie of caged dogs, goats and horses. ♣ Pass easily between this scarred area and continue climbing with views to Tour de Madeloc & Fort de Galline. Eventually, and within 200m of the D86 ‘Route de Crete’, it reaches a high point [255m] and then drops down to the road at the Col de Llagoste. Here, a table orientation is found looking back to Banyuls in the east and the high ridge of the Spanish frontier to the south. Pass this viewpoint where there seem different options to follow. ♣ The GR10 continues up the tarmac road to Madeloc but there are two tracks that go off to the left. Take the first bridle path immediately next to a pink house which starts to climb steadily again as it bends to the left in a more southerly direction. There is a bifurcation on this bend but ignore the track on the left. Very soon, one emerges at a point where another track slides in on the right and views out over the Baillaury valley, are panoramic. Tour de Madeloc is high behind, the Col de Banyuls away to the right on the horizon, below in the valley, the two hamlets of Mas Axter and Mas Parer nestle, the large craggy ridge of the Spanish frontier looms high in front whilst slightly to the left and far below, Banyuls-sur-Mer. It is a great commanding position over the steep vine clad hills arrogantly defying gravity with their strong and ancient ‘pied de coq’ drainage systems. ♣ This ancient track gently drops down along a ridge and back into scant cork oak woods before joining the car park for La Salette. 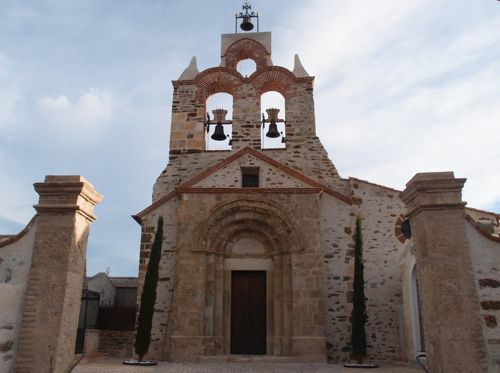 Take the track for 200m to La Chapelle de Salette; a paragon of apparent stone innocence perched on the promontary over Banyuls with its white walls being visible for many kilometres in bright sunshine. A table d’orientation here has seen better days. 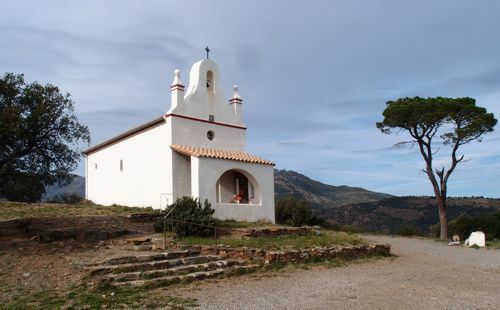 ♣ From this vantage point, the footpath drops down to the front left of the Chapelle and traverses the steep slope in a zigzag before rejoining the residential outskirts of Banyuls at Mas d’en Reig. This fascinating cluster of higgledepig round turrets, long sloping roofs and ancient Mas contains a collection of ‘must-visit’ sites, be it the Jardin Méditerranéen du Mas de la Serre (on right by the tower) www.biodiversarium.fr or the Cave Suterraine (straight ahead on right) of the Banyuls wine cooperative, the confusingly named GICB, Cellier des Templiers, or as it is called here , Terre des Templiers. www.terresdestempliers.fr Both these venues give an insight into the importance of this modest little town’s true identity. ♣ Our route drops down to Banyuls passing in front of the Cave Souterraine with its glamourous display of Catalan red barriques lying nontiantly in the hot sun and then descends quite steeply along a narrow footpath, (seriously gouged out by torrents following the inondations of November 2014) to some concrete steps just aside the Gendarmerie. From there it is a stone’s throw to the great railway bridge and Avenue du Géneral de Gaulle.